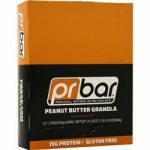 The price on 4 boxes (65gram/ 12 bars each) of the whole food ‘Best Bar Ever’ protein bars drops from $134 to $34.99 at Supplement Hunt with coupon ‘bestbar4ev‘. Shipping is flat rate $5.99 and free over $99. You can choose & mix from 3 flavors.